Are you in control of your life? If you answered yes, think about it...Are you REALLY? Sure, you control what time you get up in the morning, what you eat for breakfast, should you go to work or get the kids off to school. More than likely, you have a routine that you follow each day. You know what is scheduled, where you have to be, when and what is expected of you. So you sail along and life is good. Then, all of a sudden, out of the blue, something unexpected that's out of your control happens. It shakes your world and leaves you wondering...Why? Just like being a Cleveland Browns fan - I've realized we are not in control. When things don't go our way, I am asking the same question...Why? As I sat through a close scoring game against our hated rivals last Sunday night witnessing another frustrating coaching decision that I didn't agree with I asked that same question. Why? Instead of trying to tie the game with a little over three minutes left, the decision was made to kick a field goal. This put the ball back in the hands of the opposition and left us without another opportunity to score. But we still needed a touchdown to win. I was livid and could not believe they weren't playing to win. 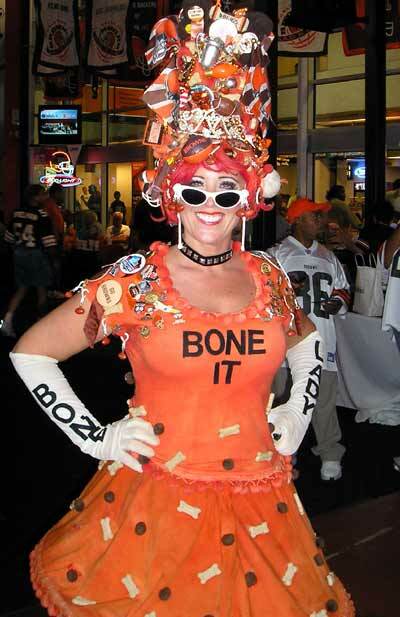 I realize that no one asks the Bonelady which call to make or what play to run. All I can do is buy a ticket, cheer my team on (sometimes loud enough to force the other team to call a timeout) and keep watching and supporting my beloved team. Even if the 12th man (fans) is a factor in the game, we really are only spectators. We can't control what decisions are made on the field even though we feel the frustration when it's not what we would choose to do. Isn't life similar? We can plan and go about our days participating in life but not really in control of any of it. If you believe in a power greater than yourself, that there is a reason and plan for your life on this earth, you will realize that much of your life is not controlled by you. When those difficult circumstances appear out of the blue, that's when you know you aren't in charge. How you react to those difficult times is how you shape your life. Do we let it devastate us to the point of giving up? Or do we choose to see the blessings as we handle what is thrown our way? The most deep soulful growth experiences of my life have been as a result of going through some very tough times. I wouldn't change one of those experiences no matter how painful they were. Those moments are when I found out who I am and what is important to me. The same with being a Browns fan. Those "almost" moments of being victorious and those many heart wrenching disappointments have caused my loyalty as a fan to deepen and my bond with other Browns fans to strengthen. I've learned to let go and let life unfold as it is meant to. Yes, I know you still have to take care of things and go about your daily tasks. But when my routine is interrupted by something I wasn't expecting, I just go with it and let it roll. Life is just like a river current flowing as it is supposed too. When I let go of being in control, my life flows. But when I try to change circumstances, control other people, and make things go my way, my life stops being easy and becomes one full of turmoil. Look, there will be times when the current seems rough and other times when it ripples so effortlessly. That's life. That's how it's supposed to be. I keep going and don't give up. Just like last Sunday when I was so frustrated by the game plan decision to kick that field goal and lose AGAIN to our dreaded rivals I had to let it go and remind myself that I had no control over that outcome. So I walked out of the stadium knowing there is a game next week. True fans don't give up just because they don't like the end result. No matter who owns the team or coaches it or plays, the Cleveland Browns are MY team. I'm a Browns fan til the day I die. I'm also a fan of my own life. There's so much about it that I enjoy and love. When times are tough I continue to let go and let my life flow as it is meant to ... and as far as my Brownies...well there's a new game to be played on Sunday. I will watch, cheer and probably yell at the TV if I don't like what I'm seeing. But I will enjoy those few hours experiencing the good the bad the ups the downs. I have no control over what happens. What's meant to be...well... it will be...and if it's not what I wanted...well there is another game next week too!!! !